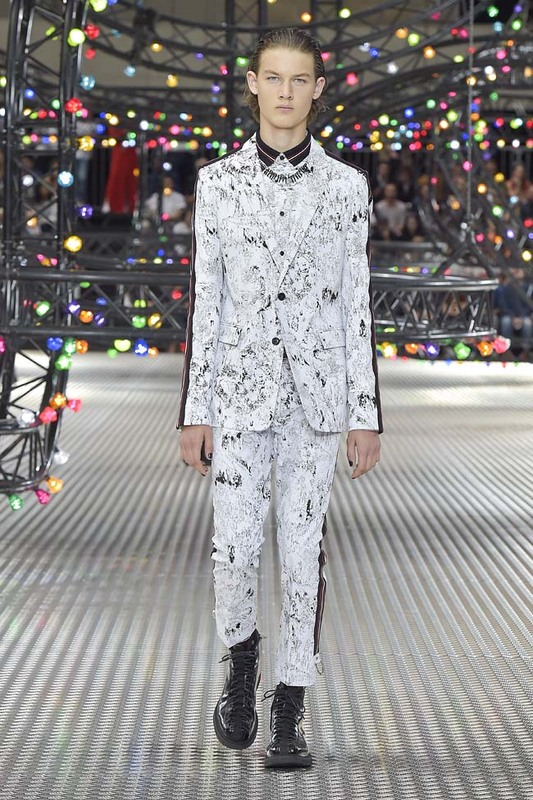 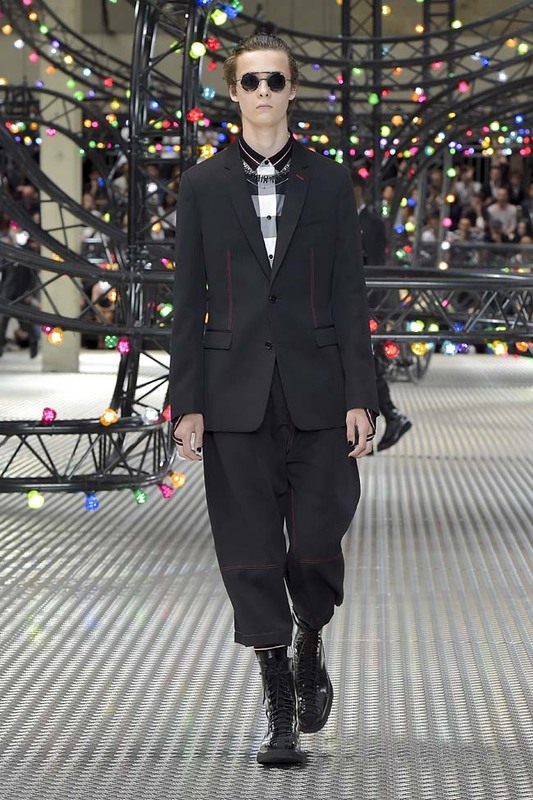 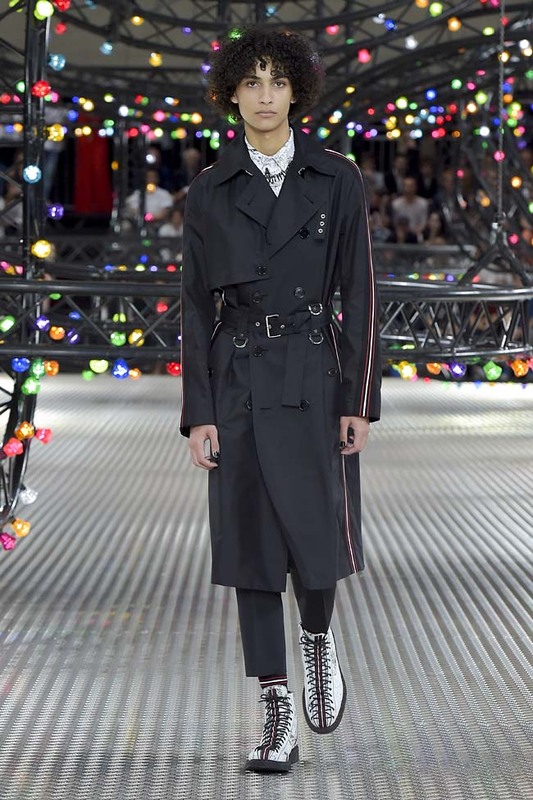 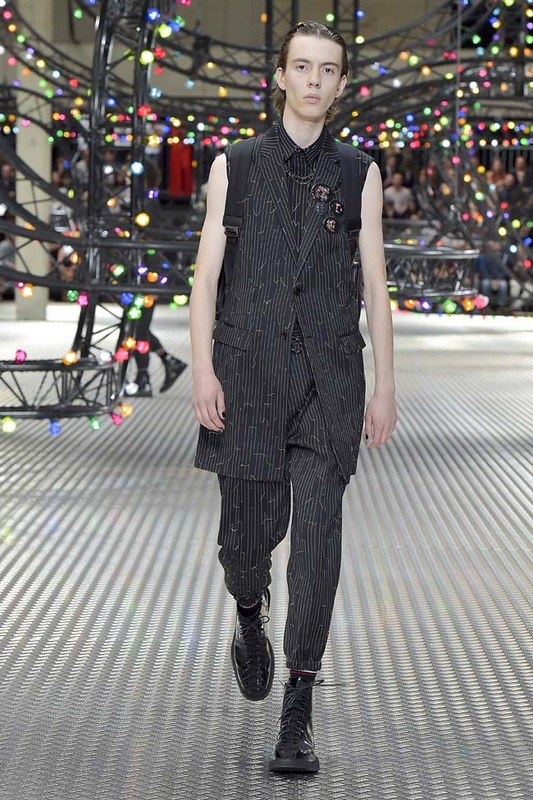 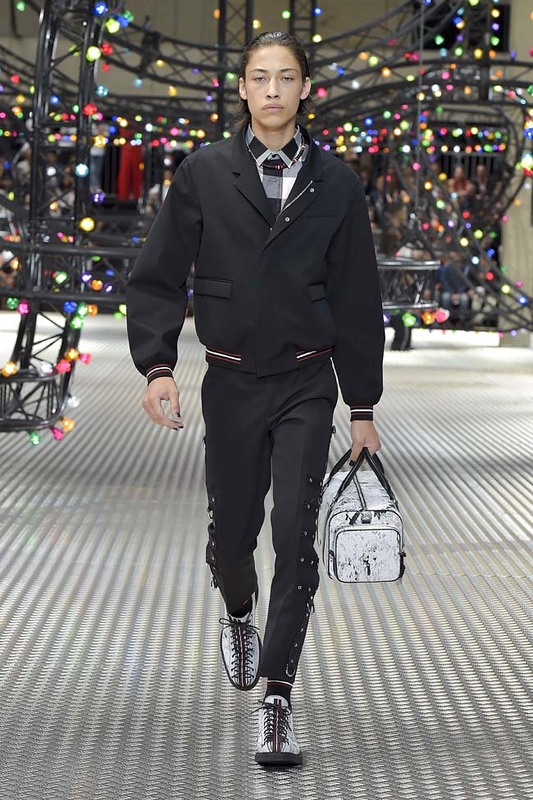 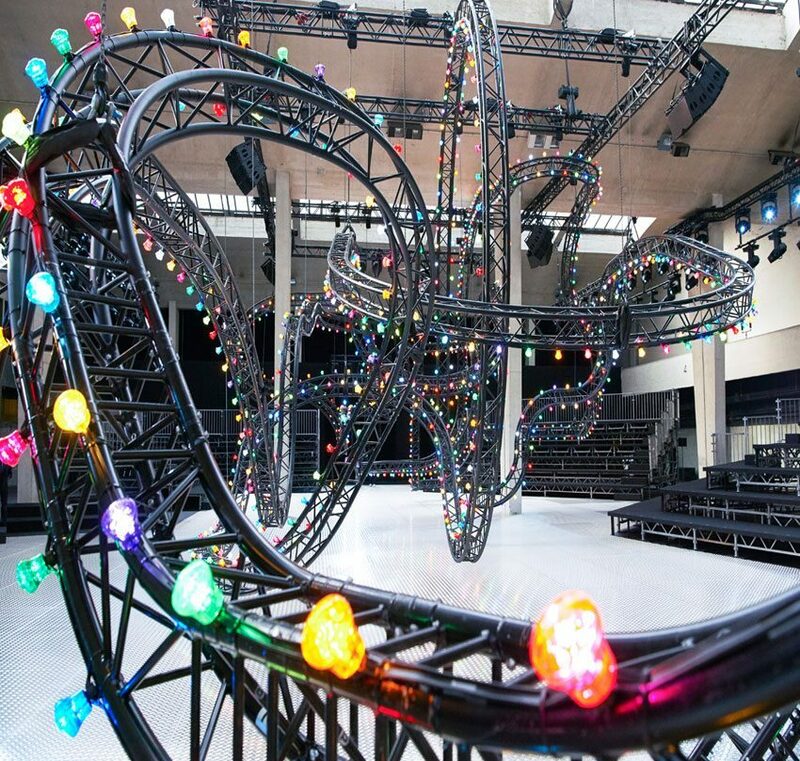 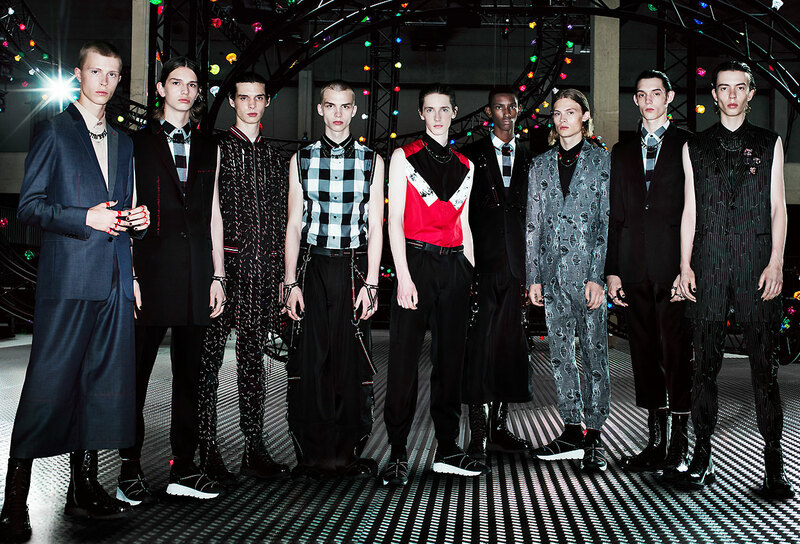 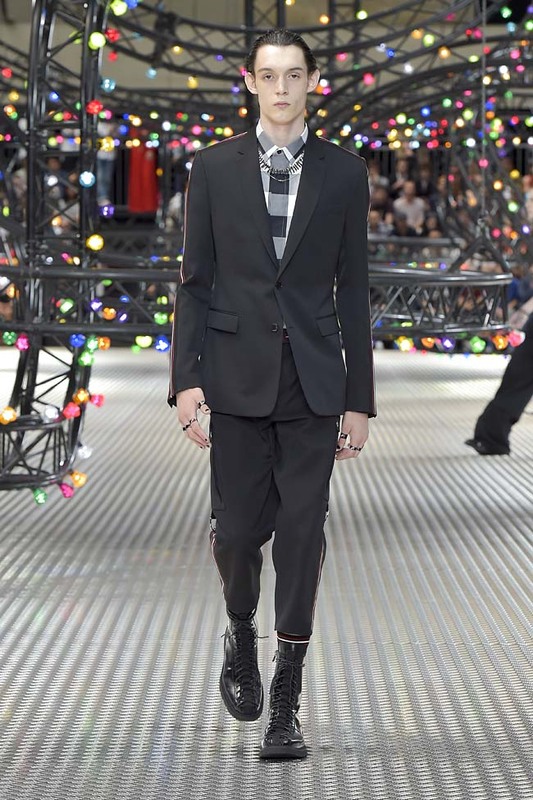 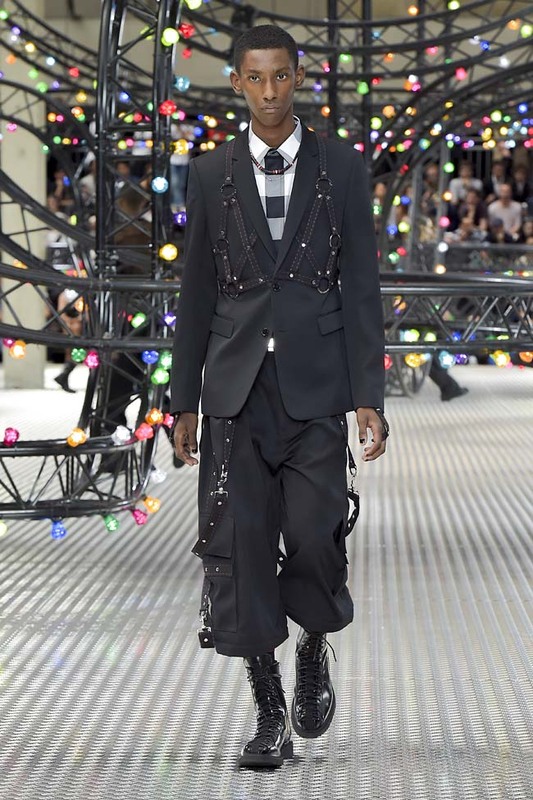 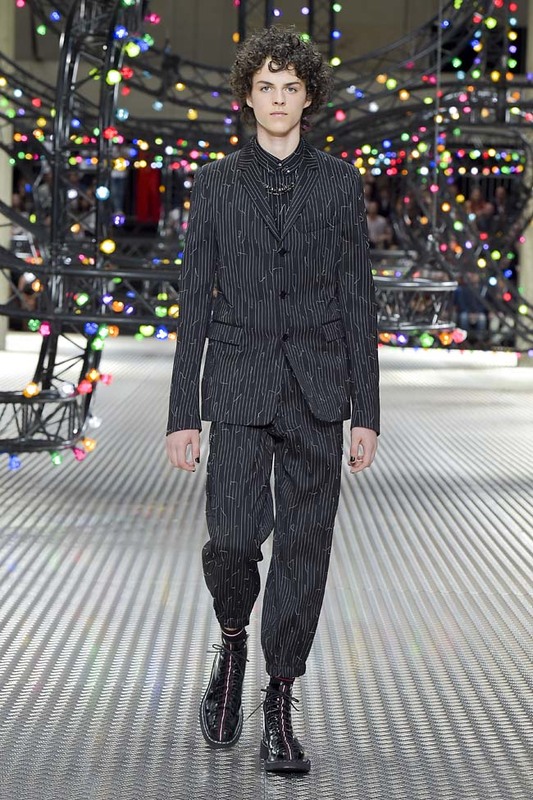 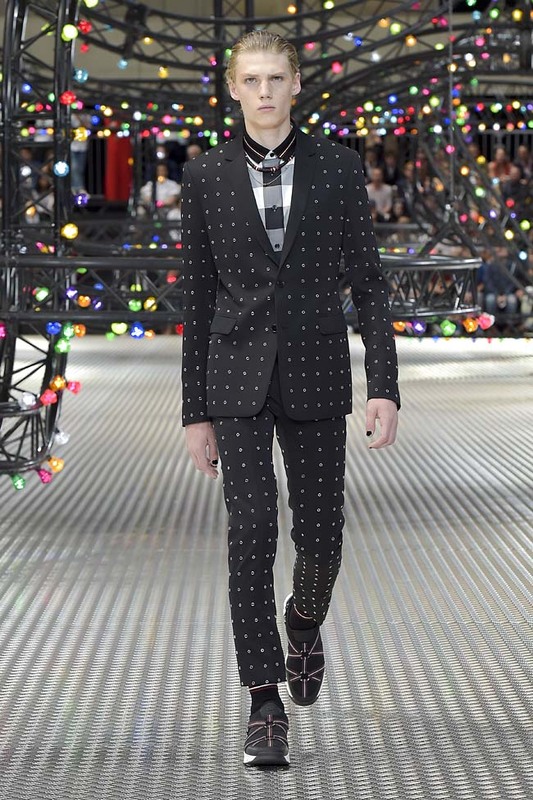 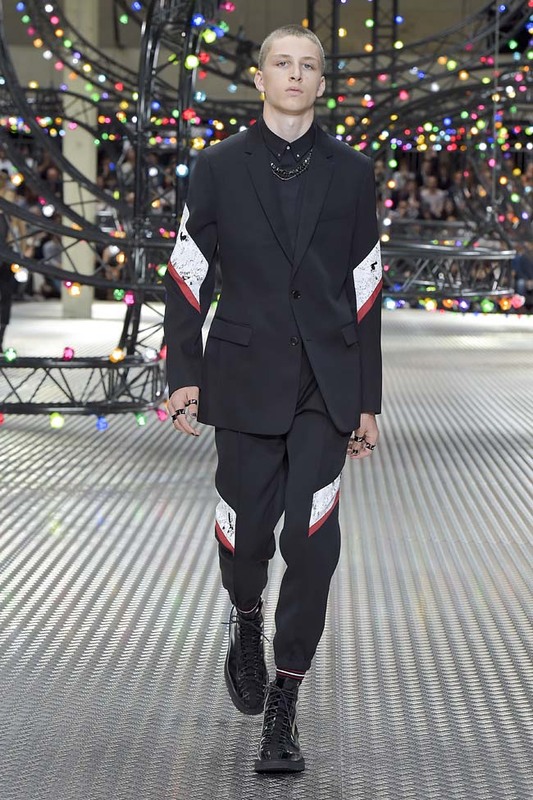 Discover the latest Dior Homme Summer 2017- Fun Fair collection. 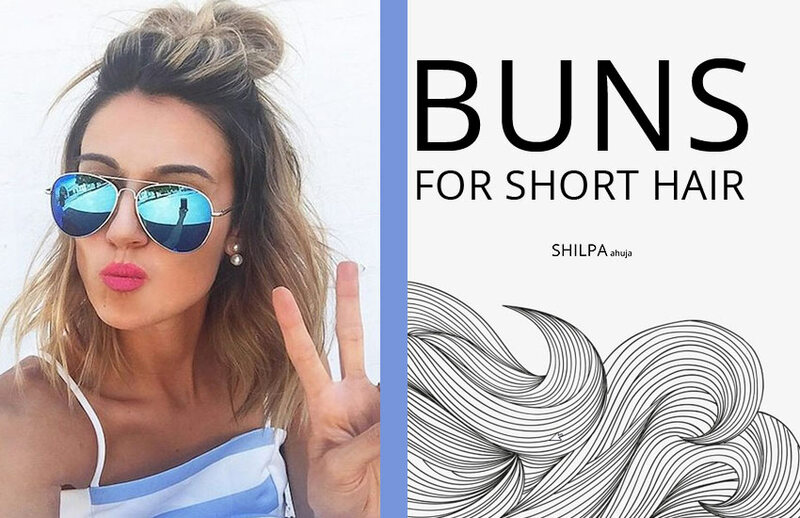 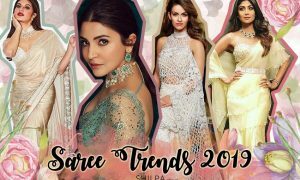 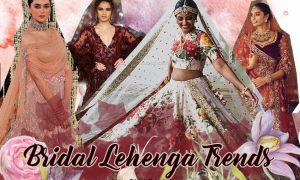 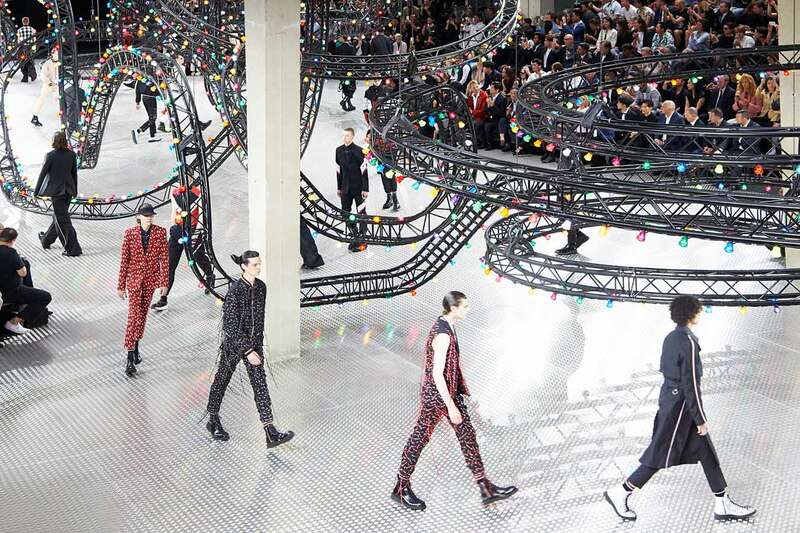 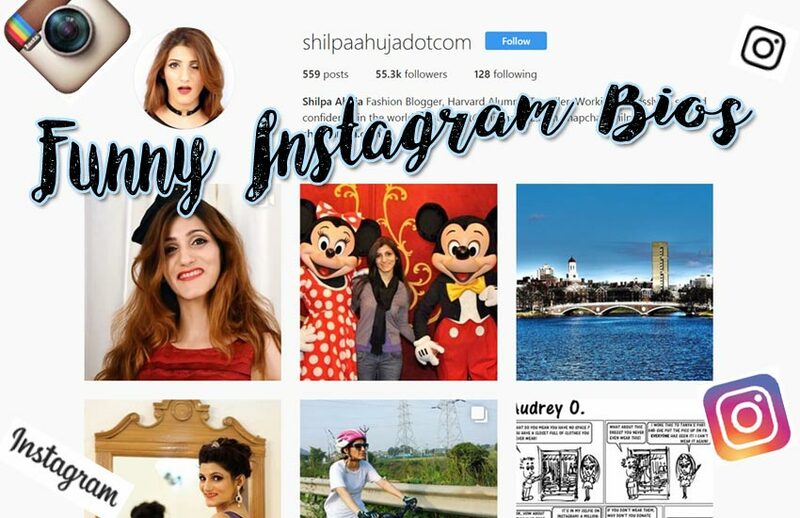 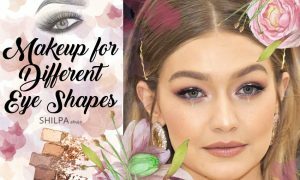 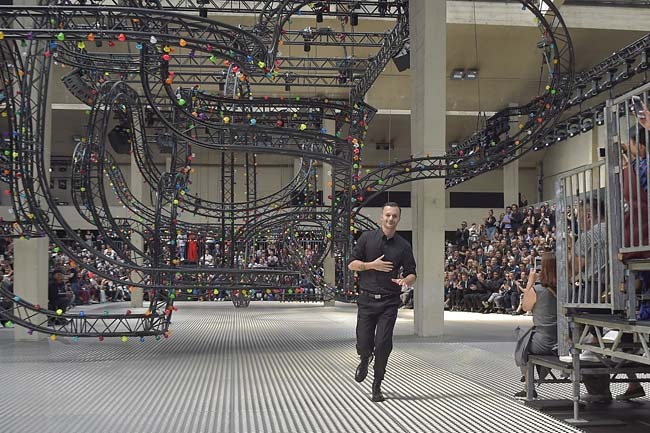 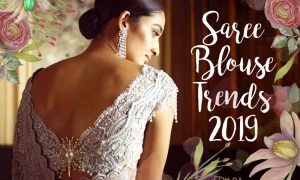 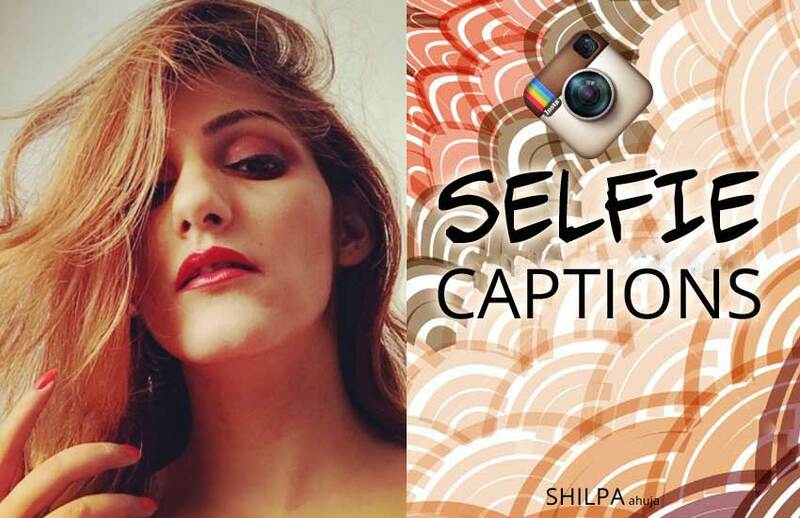 Read our review, view our favorite looks and the roller-coaster runway design! 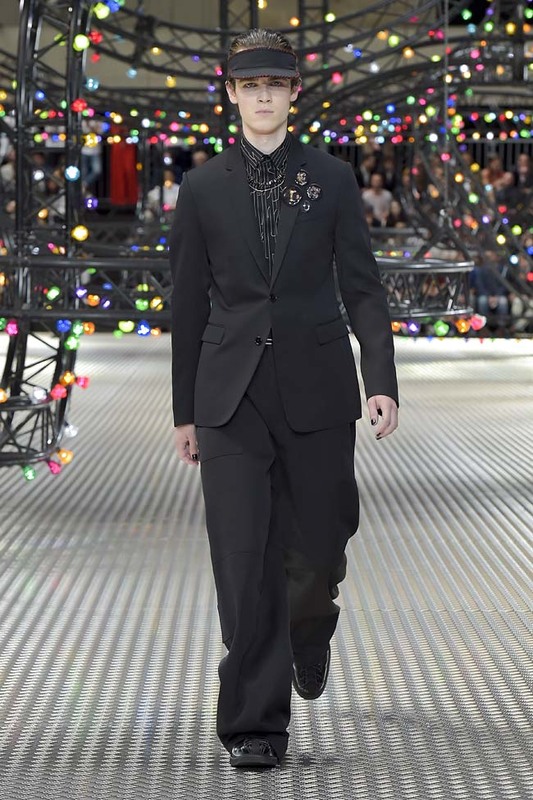 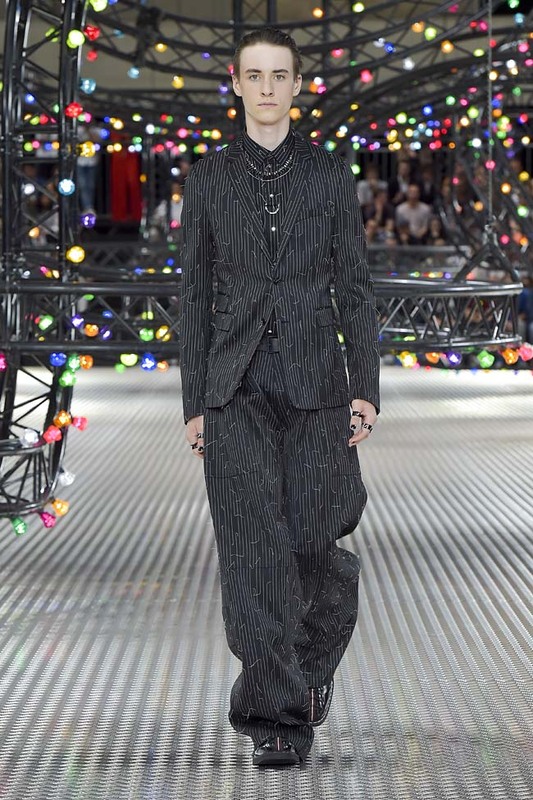 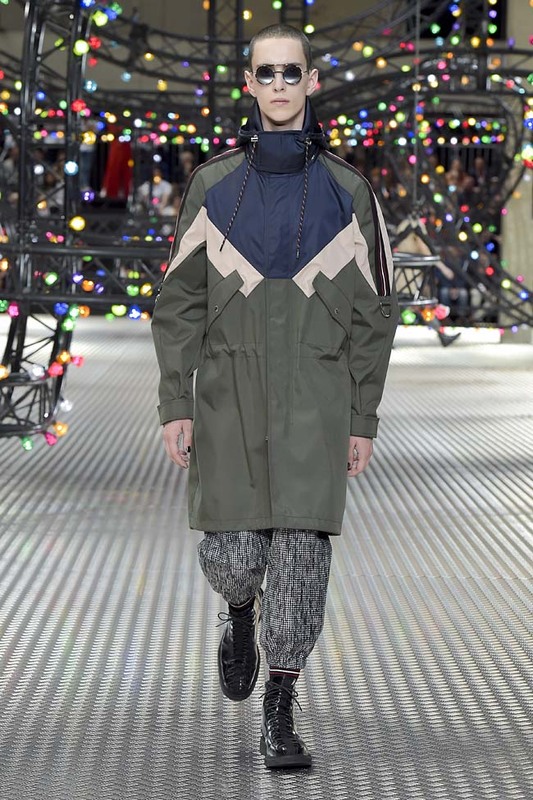 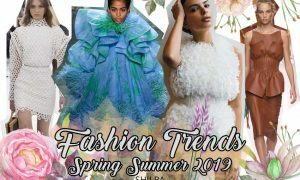 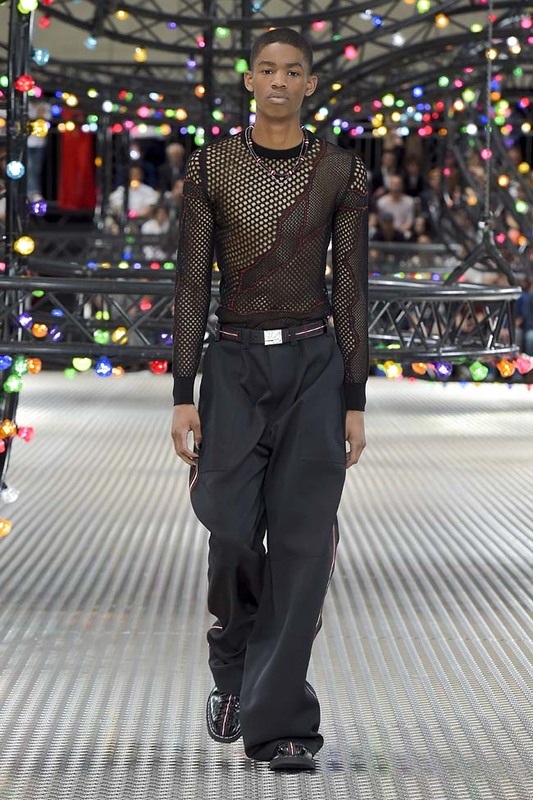 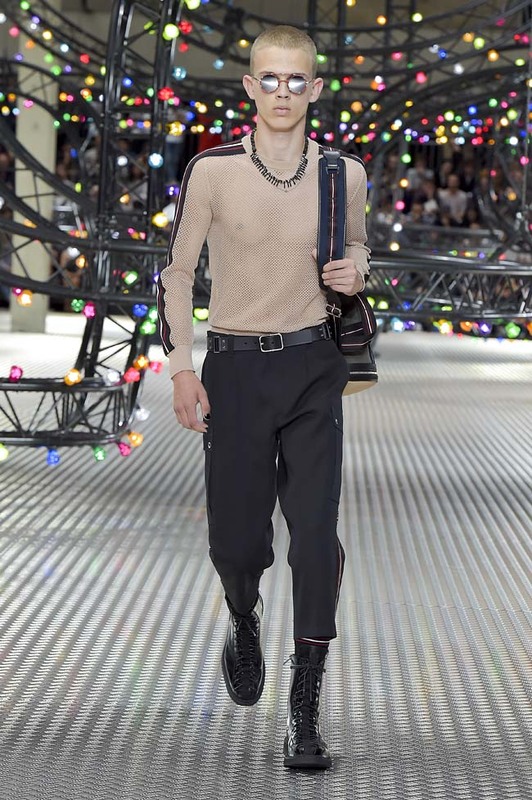 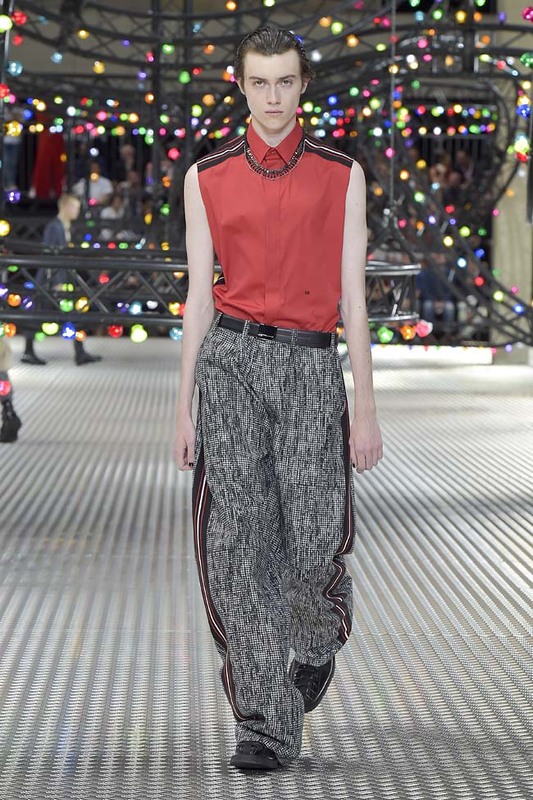 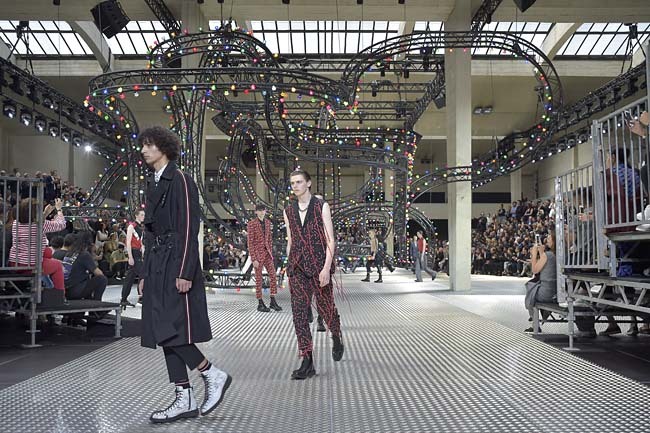 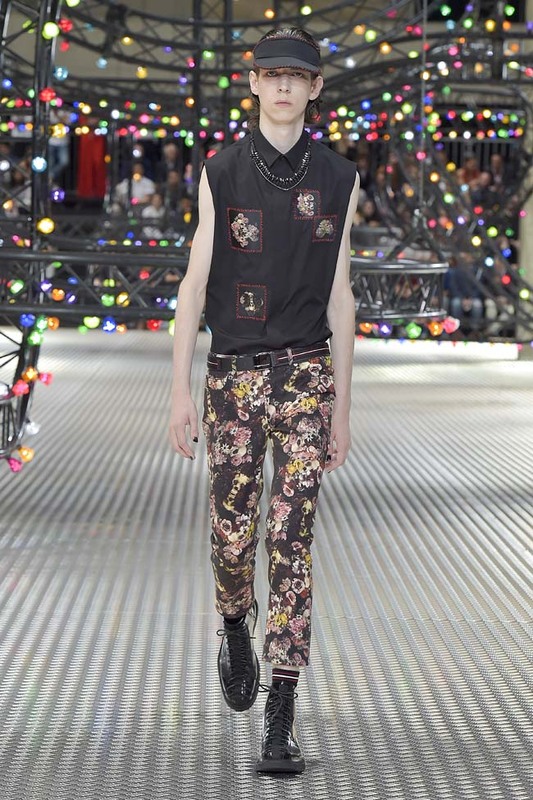 The men’s show started with calf length pants and suits, checkered shirts with jackets and gradually moved to sleeveless shirts paired with loose or flared crop pants. 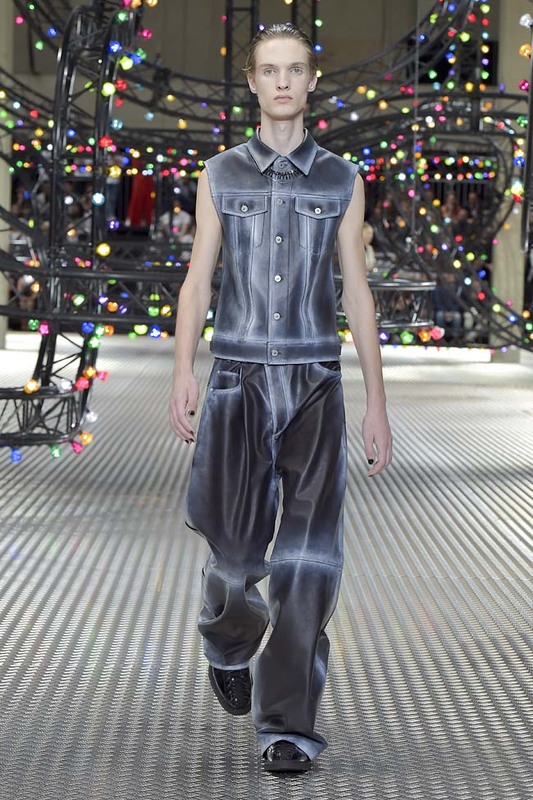 From calf-length to slim-fit, from straight to flared, a wide variety of pants was seen. 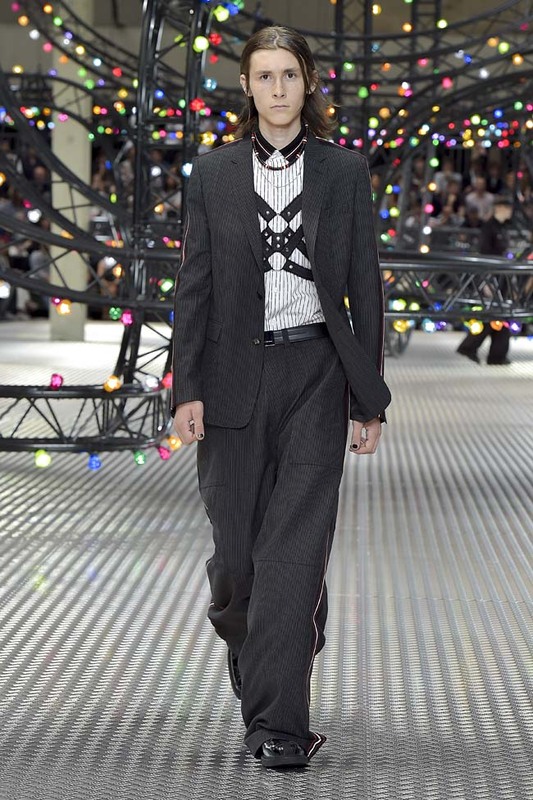 I liked the grey pin-stripe pants the best. 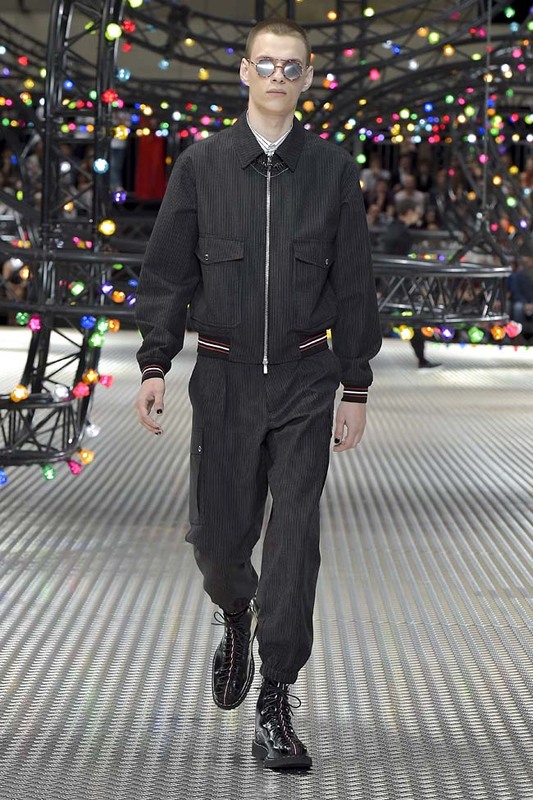 The color palette was majorly black, red, grey and white with some khaki and beige thrown in. 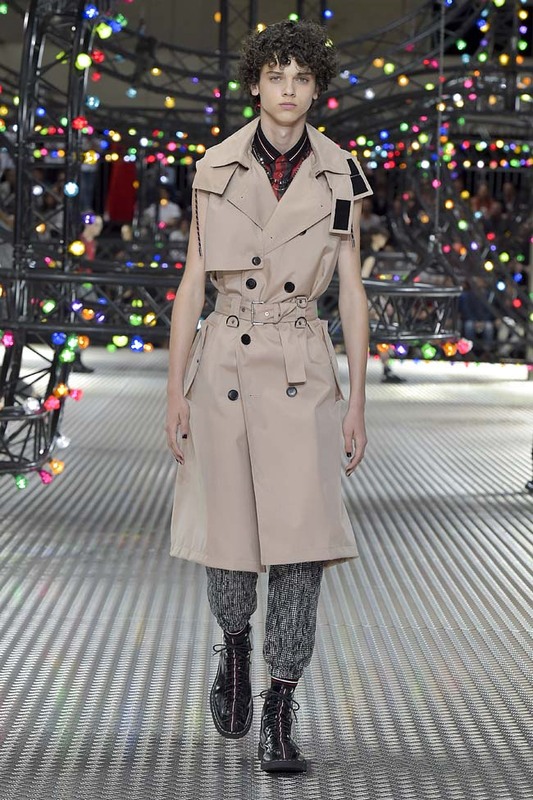 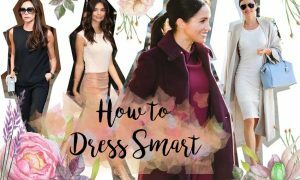 Coats and trench-coats with notched lapels, both sleeveless and full sleeved, were also seen. 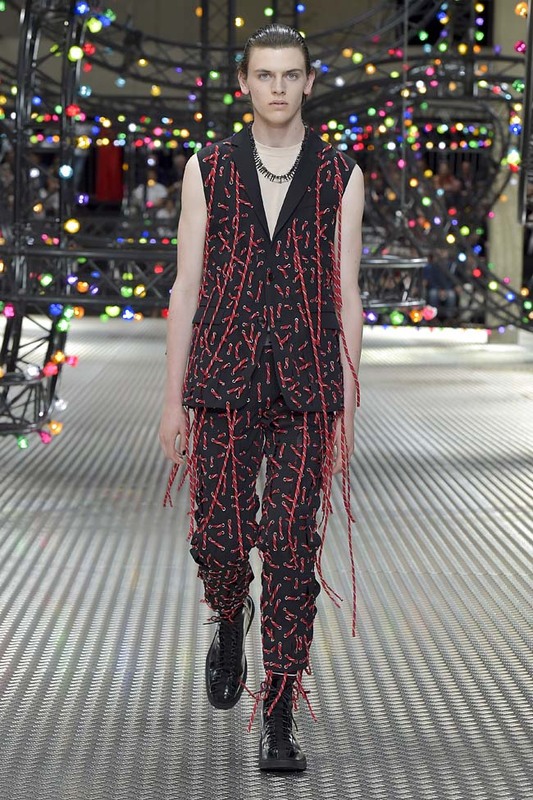 Some outfits had shoe-lace-like strings hanging down in a unique, chain-mixed-with-fringe sort of way. 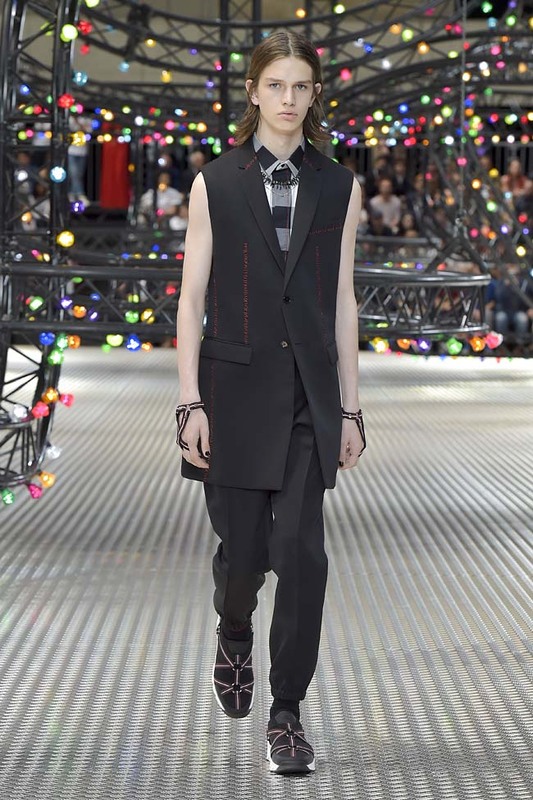 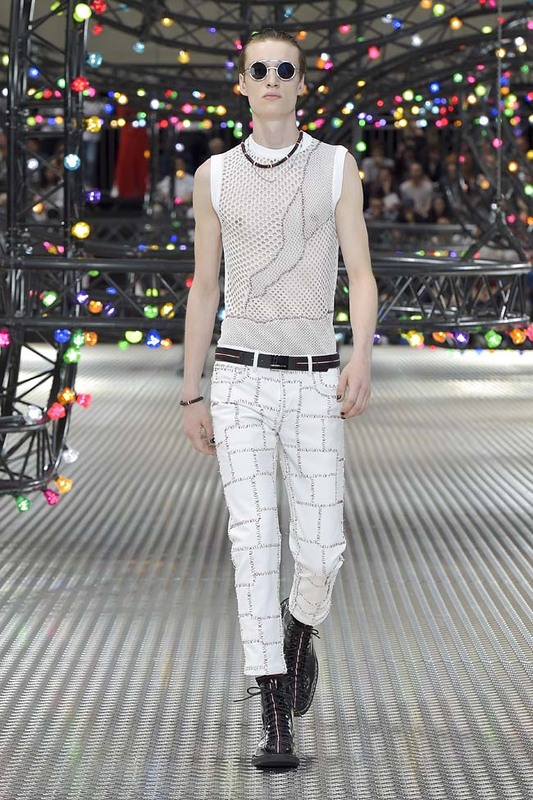 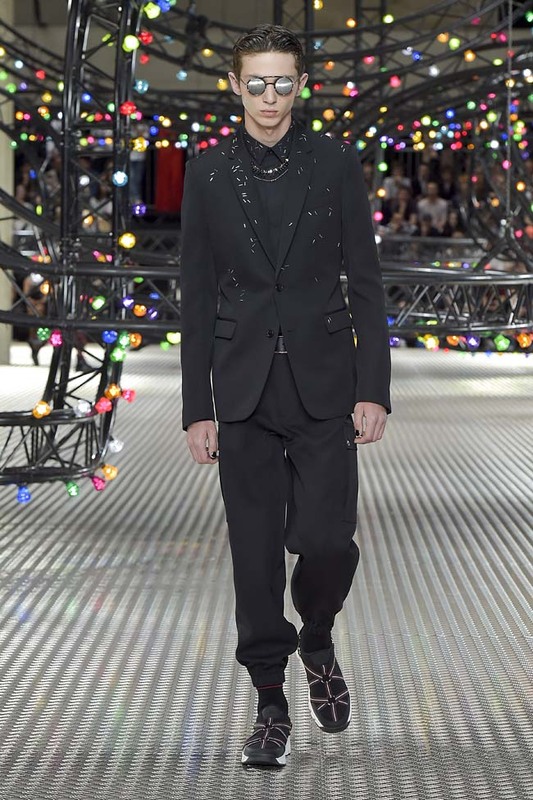 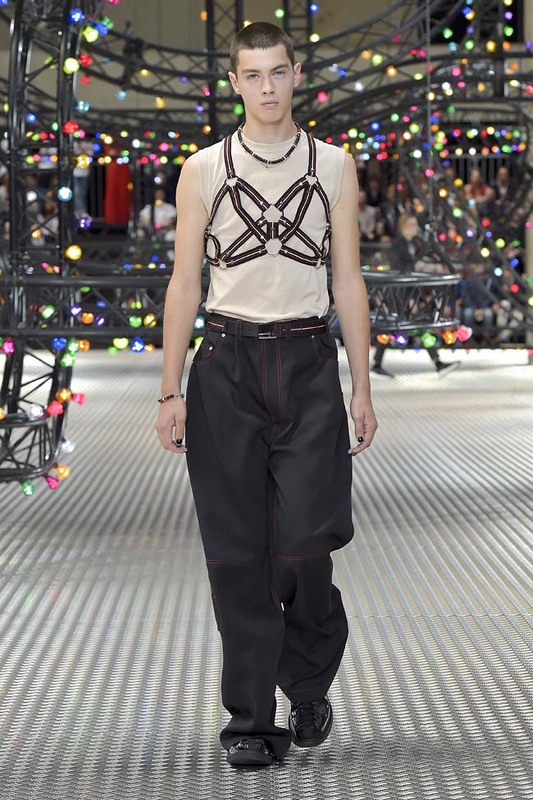 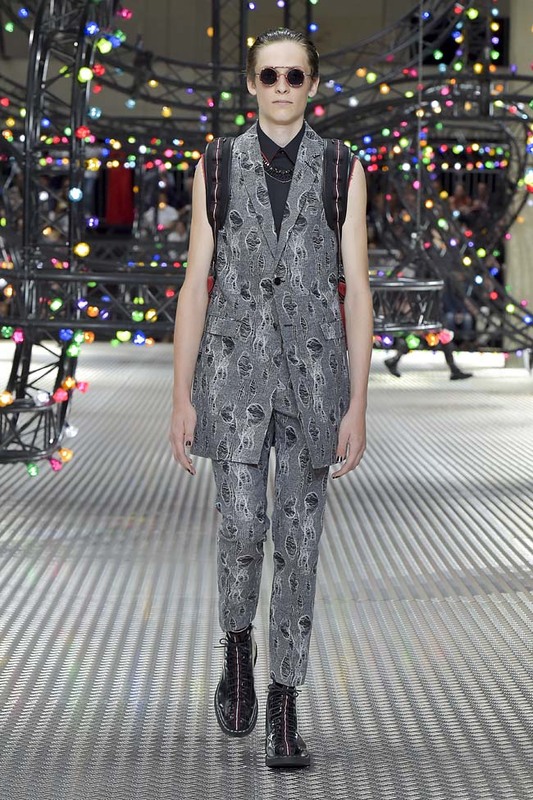 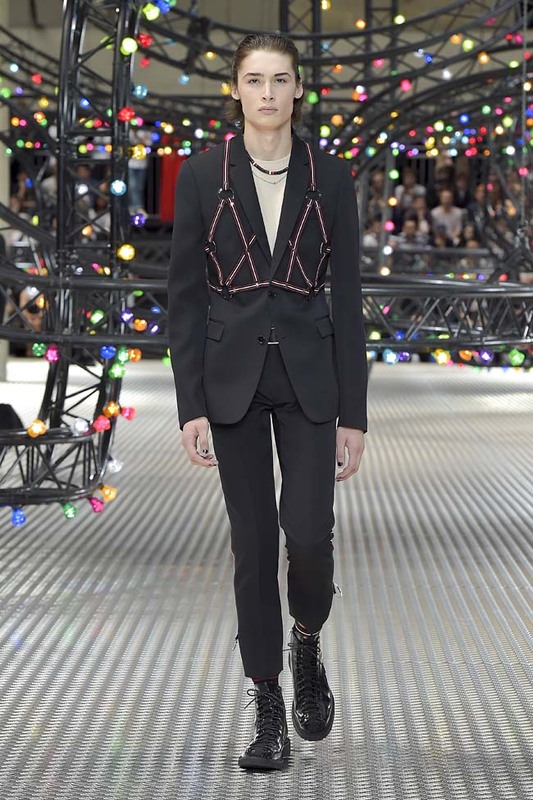 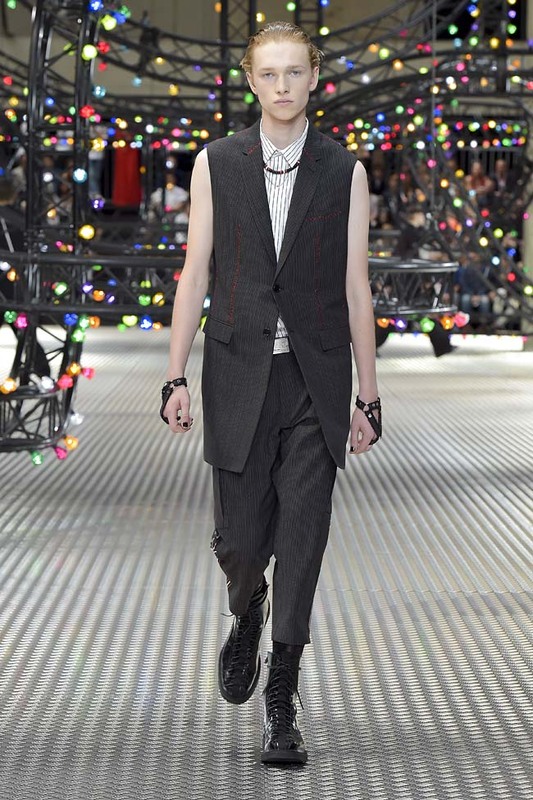 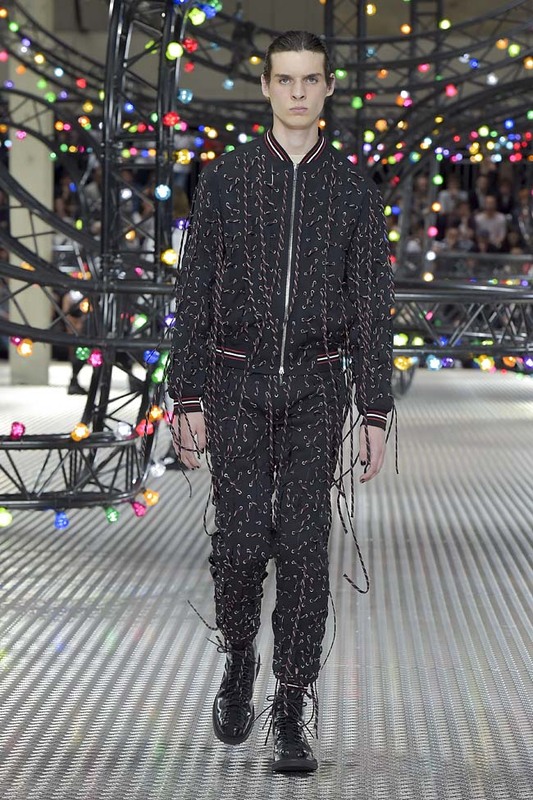 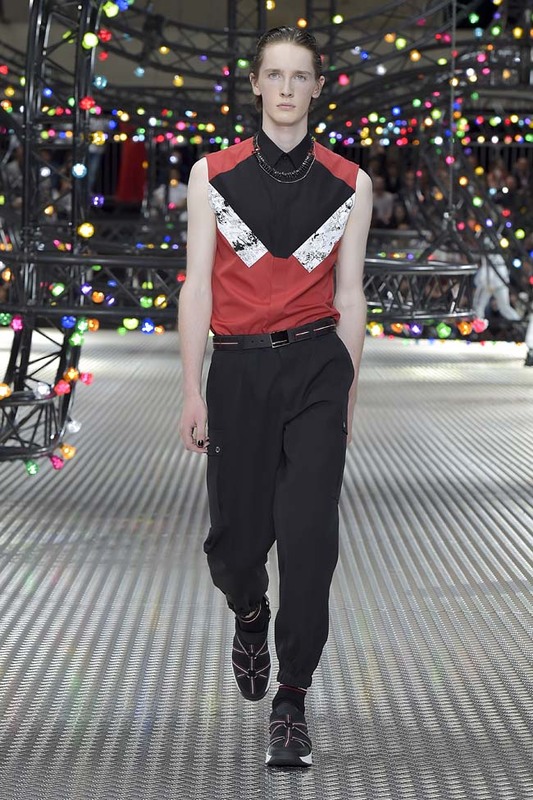 Necklaces and suspenders were the two accessories that formed a part of nearly every look in this menswear collection. 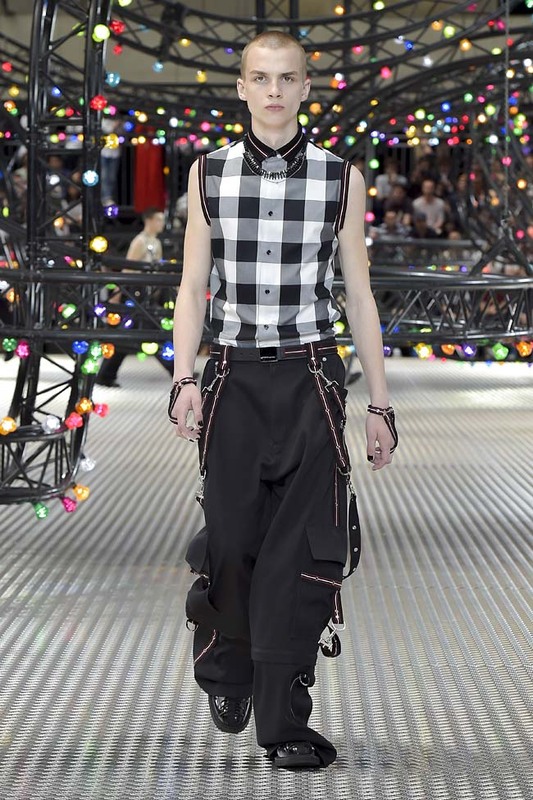 Suspenders hung loose over a pair of loose black cargo pants, and formed a multi-strap adornment over shirts and suits in other looks. 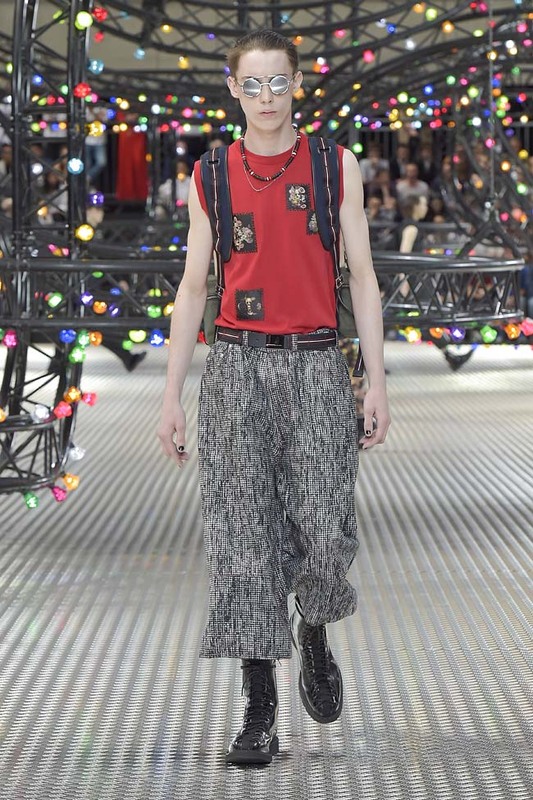 Other accessories includes sports visors, belts, broad strap messenger bags and round sunglasses. 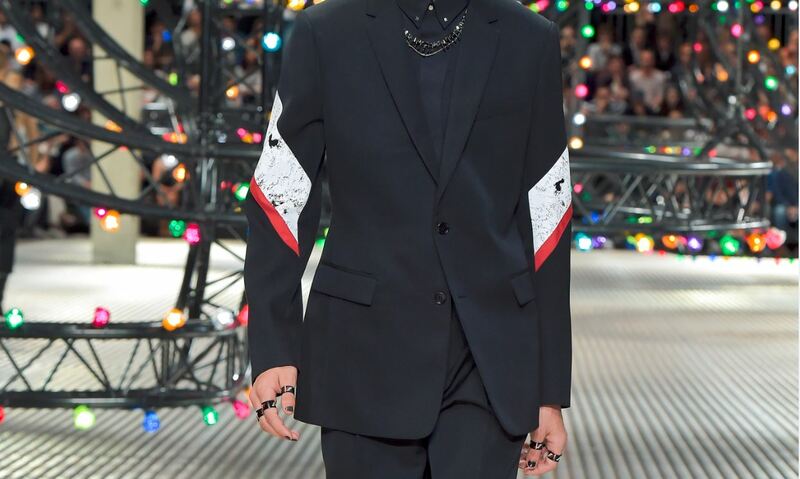 The unique thing that most popped out was black nail polish which is expected to be point-of-conversation this season. 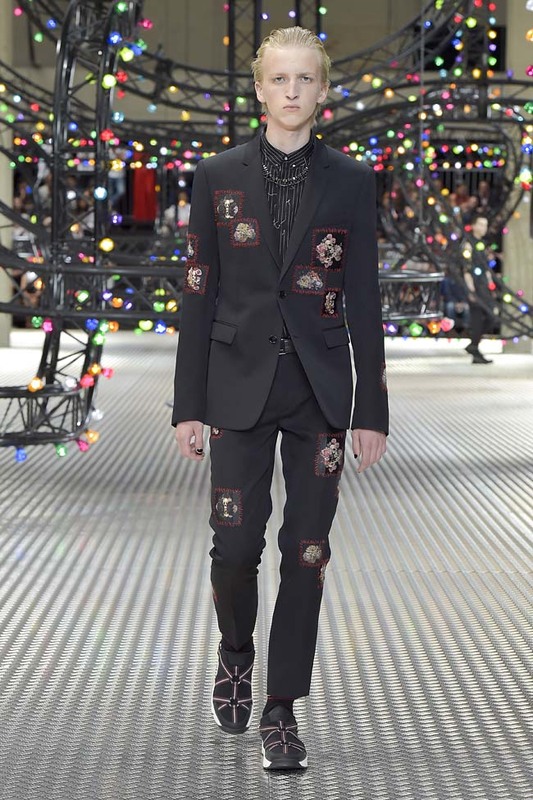 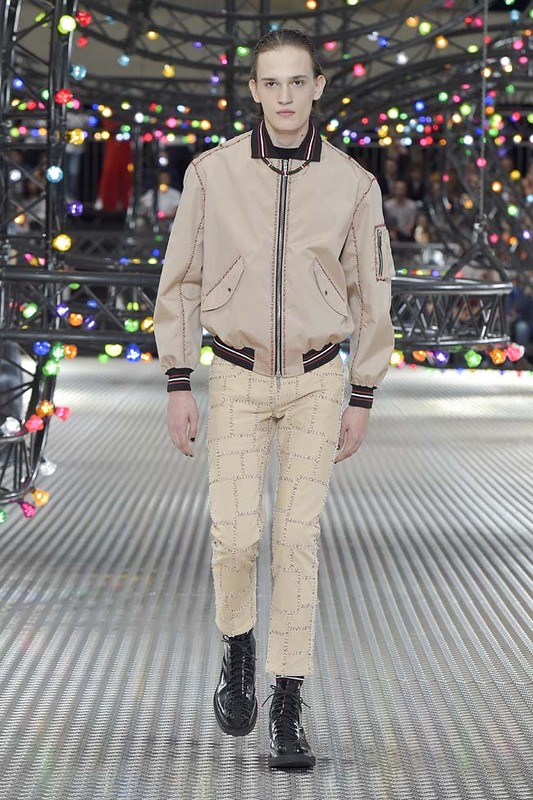 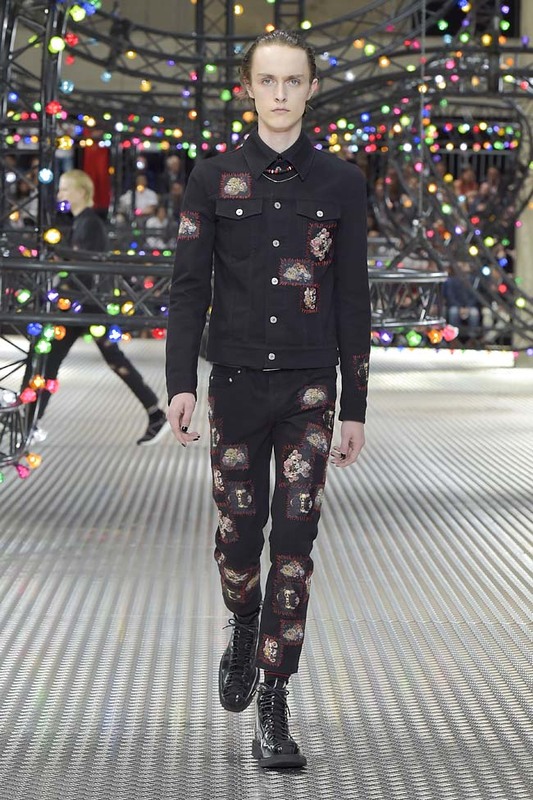 Patch-work was seen in pants, shirts and coats which were paired either with a sleeveless tee or formal pants. 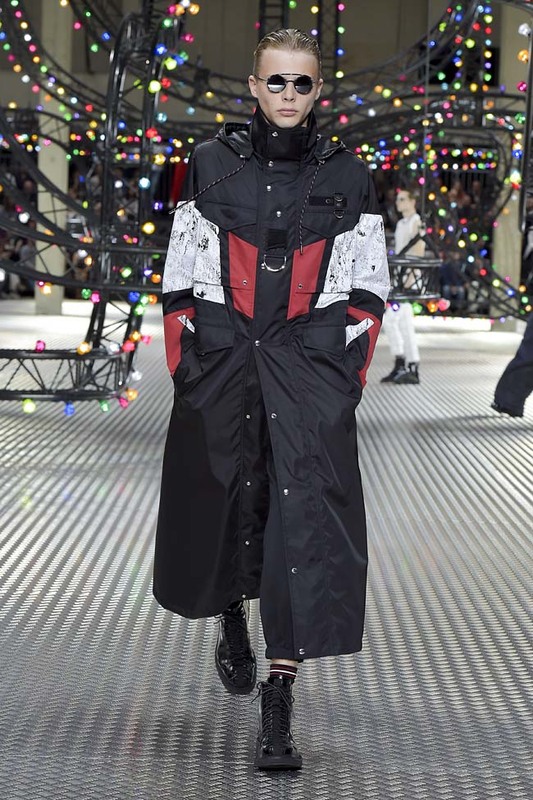 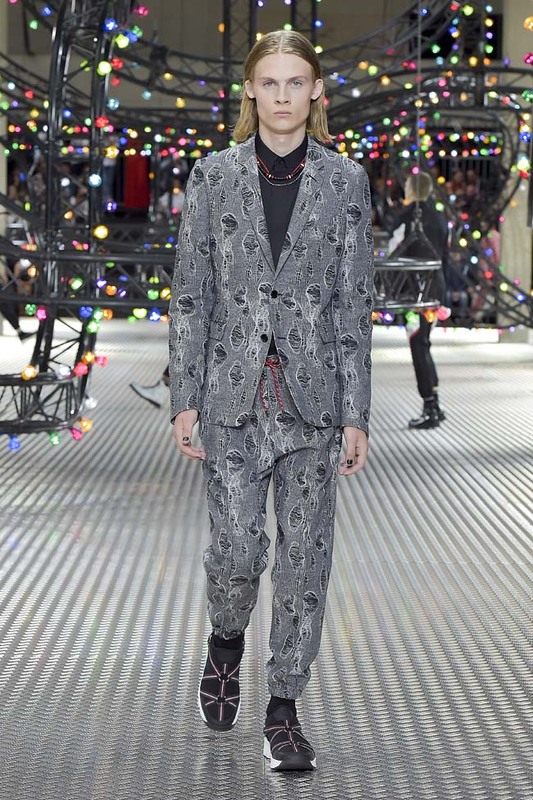 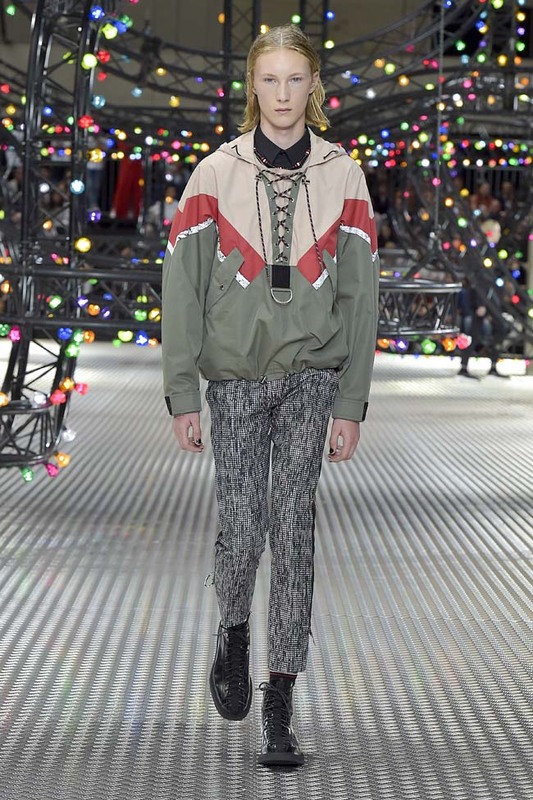 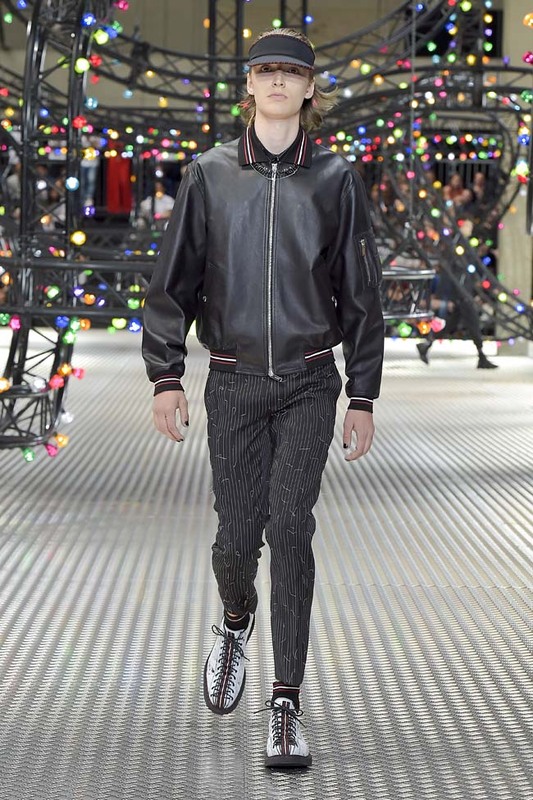 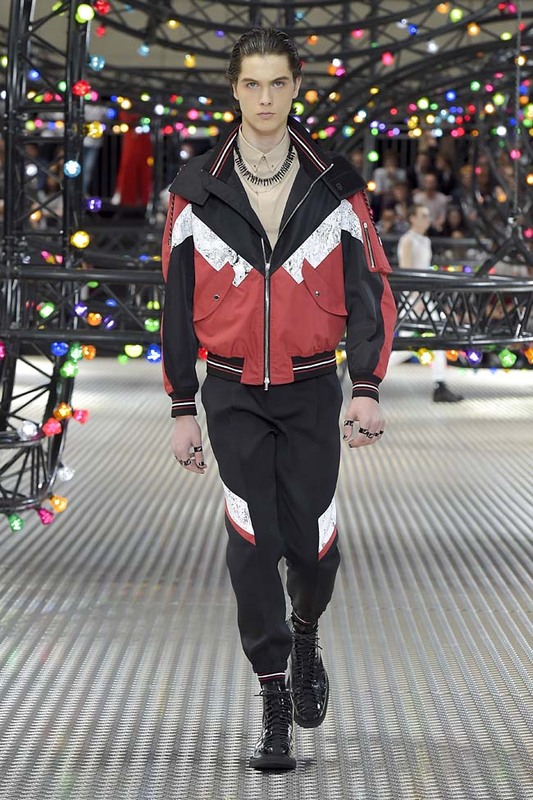 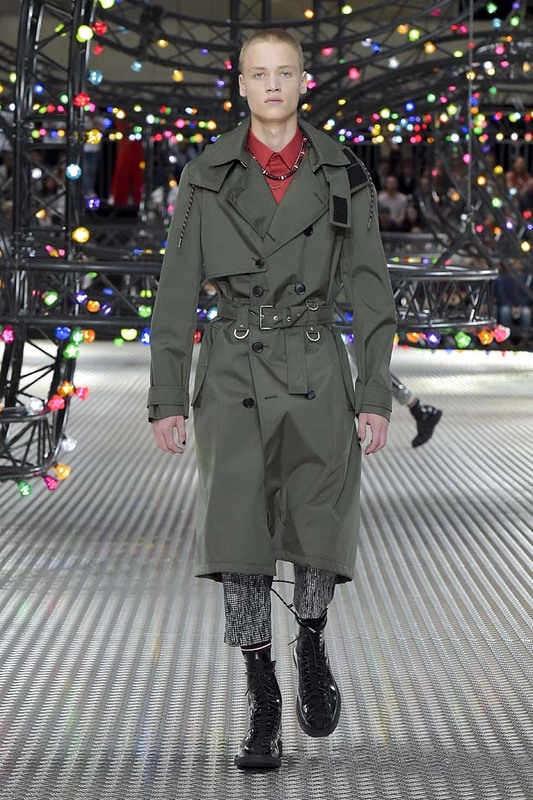 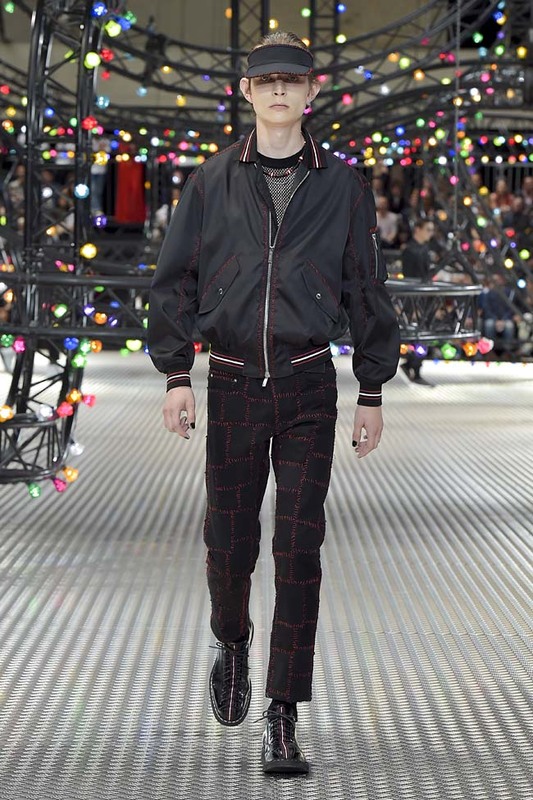 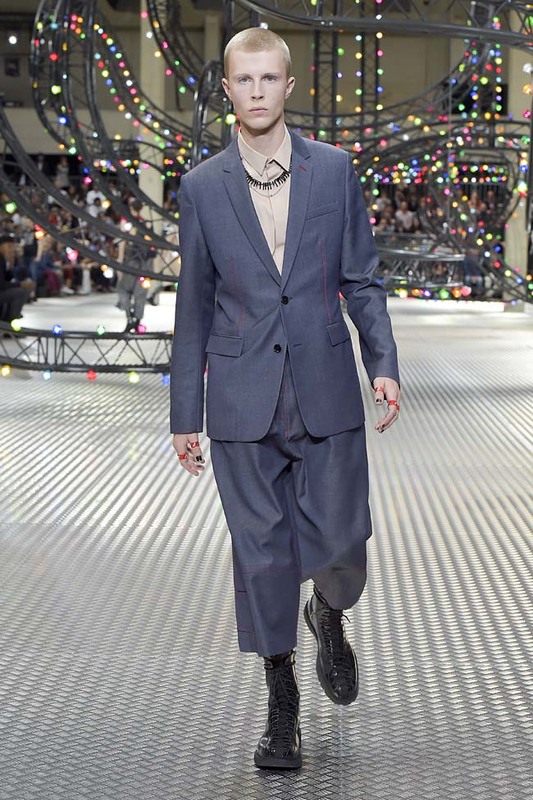 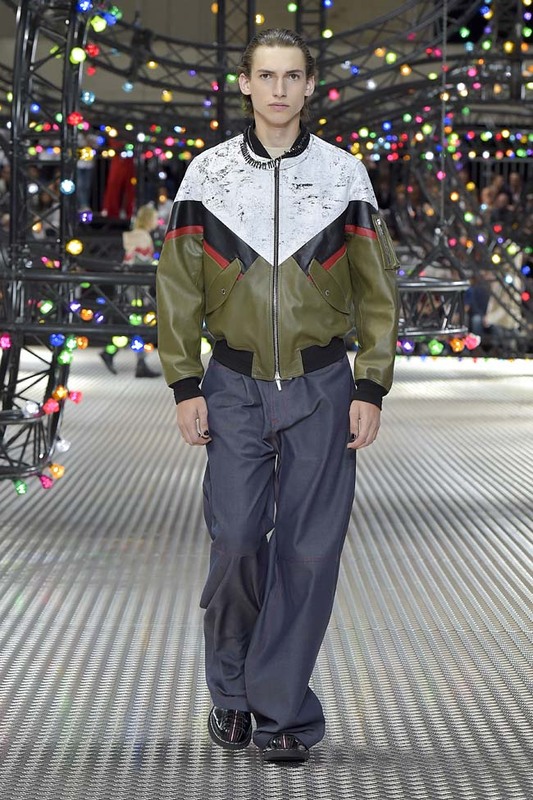 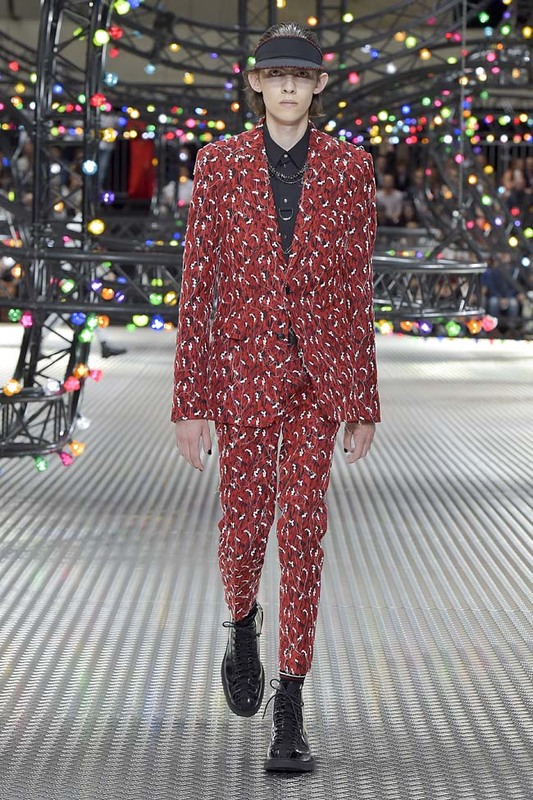 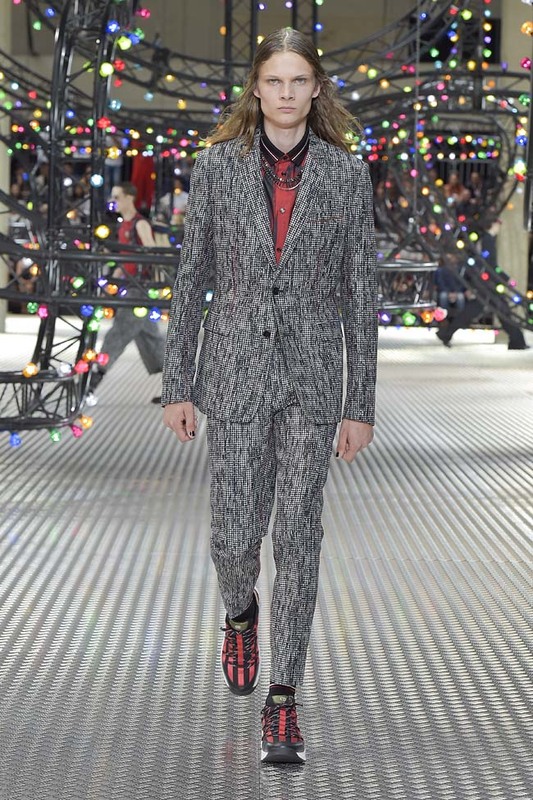 My favorite looks from the Dior Homme 2017 collection are the patterned red jacket paired with slim-fit trousers and the washed-effect grey outfit.